Feathrr complements what fashion retailers have always done: help you help customers look their best. 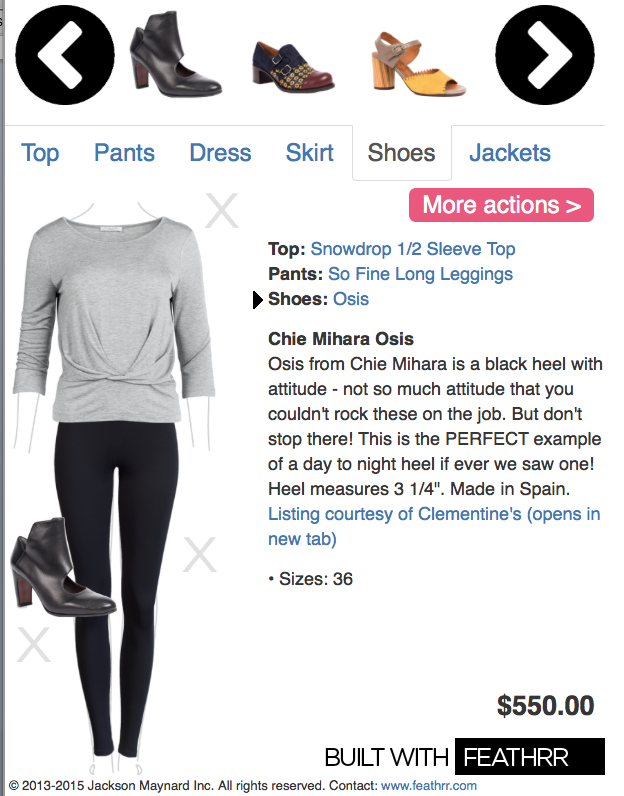 Feathrr provides a virtual wardrobe builder on your website, where your customer can simply drag and drop clothing from your clothing catalog to create outfits. Feathrr also helps customers easily and directly contact your store about the outfit, or share the outfit with their friends and trusted experts. Finally, Feathrr provides retailers with easy-to-understand distilled insights about customers’ activity, including where your customers are located and what clothing they are most interested in. What’s the benefit of Feathrr? Feathrr increases customer interaction on your website, providing a deeper connection with your customers. When customers spend more time checking out your inventory, they see more of your inventory, discovering more of your store and more of what you have to offer. Feathrr also provides retailers with deep insights into customer behavior while customers are shopping, and more importantly when they are thinking about your store. With this information, you can draw a complete picture of how your online store connects with customers. We deliver this information to you in a convenient report delivered to your inbox. Feathrr is a hosted service. You keep your current website, domain and e-commerce host. We provide the service, and it’s viewed by your customers on your website. It all begins with a conversation. Contact us to talk about your inventory size, your customers and your current e-commerce provider. Next step is analyzing your current and upcoming clothing inventory to fit your store to our service. We then have professional photographers shoot your clothing in our studio for use with Feathrr. Once we combine your clothes information, the photos and our service on your website, we’re done!